The meal credit of INR.1000/- inclusive of taxes per person per day. Only applicable for dinner at “Sake” non-refundable. Applicable only on Food. Cannot be redeemed for hard liquor, soft beverages etc. Meal credit applicable for adults only. Guided tour of our Organic Vegetable Garden. Extra Adult – 40% of the package amount. (Child above 12 years will be considered as adult) – includes extra bed Maximum occupants - 3 adults OR 2 Adults and 2 children below 12 years per Room. Single Occupancy – In case of single occupancy, there will be a discount of INR 1000 Per Room Per Night on the above mentioned rates. A tiny emerald land on the west coast of India is Goa, with its natural scenic beauty, attractive beaches, churches and temples. 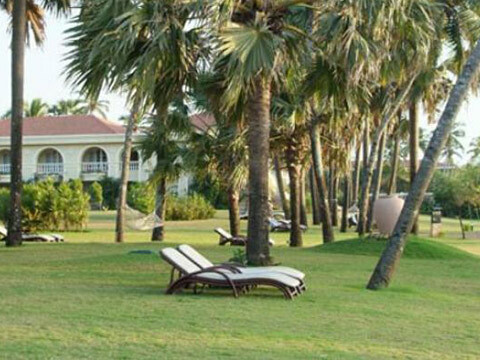 In the midst of which is our Goa beach resort–The Zuri White Sands, Resort & Casino. Chic in decor and detail, each room at our resort in Goa is designed to keep you as comfortable as can be, offering the finest combination of style, luxury, comfort and service under one umbrella. With 37 acres to explore, there’s a lot worth doing and seeing at this Goa hotel. Rich, mystical cultural heritage that spans back in ages; Goa opens its secrets to those who wish to leave behind the stresses and worries of everyday life. Situated on the shore of the longest beach, The Zuri White Sands, Goa Resort & Casino in Varca Goa epitomizes Goa’s true spirit and flavour. As the sole five star deluxe hotel in Varca Goa, every day is a celebration full of music, dance, fun and elation at The Zuri White Sands, Goa Resort & Casino. The Zuri White Sands, Goa Resort & Casino offers the best in accommodation and cuisine with plenty of facilities and services to play the perfect host. 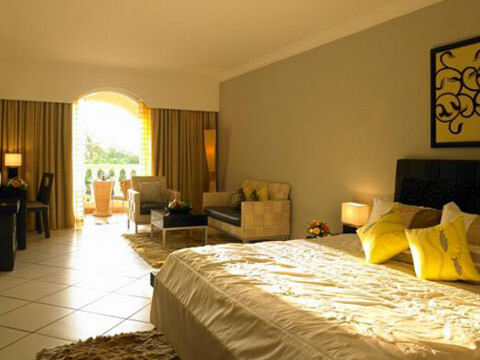 With 154 well appointed, spacious guest rooms and expansive options for dining, from Pan Asian to delectable Goan cuisines, The Zuri White Sands, Goa Resort & Casino in Varca Beach Goa promises an exemplary experience with a plethora of recreational activities for you and your family so that the fun never stops. 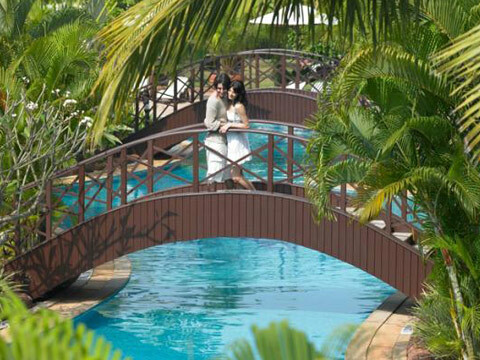 Beautiful and exotic a place as Goa is, is best known for its sun-kissed beaches, serene blue seas and lush greenery which has been very well maintained; you find a reflection of the same at The Zuri White Sands, Goa Resort & Casino. This Goa resort also boasts a gigantic meandering swimming pool that stretches across the resort, making for a location that is a grand sight to behold. 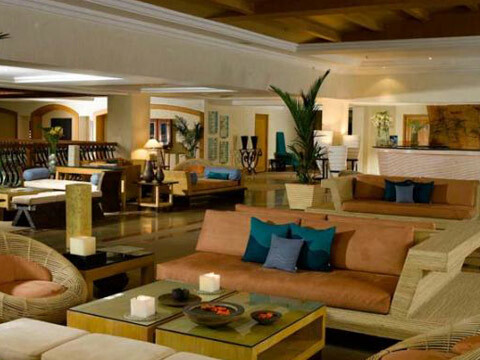 Having won the prestigious Carlson President’s award for “Best Hotel” consecutively for four years in a row, we continue to offer our guests the best of service and amenities as well as our the latest addition, the newly opened casino–The Dunes, the only one of its kind in the land of Goa. Rich, mystical cultural heritage that spans back in ages; Goa opens its secrets to those who wish to leave behind the stresses and worries of everyday life. Situated on the shore of the longest beach, The Zuri White Sands, Goa Resort & Casino in Varca Goa epitomizes Goa’s true spirit and flavour. As the sole five star deluxe hotel in Varca Goa, every day is a celebration full of music, dance, fun and elation at The Zuri White Sands, Goa Resort & Casino. The Zuri White Sands, Goa Resort & Casino offers the best in accommodation and cuisine with plenty of facilities and services to play the perfect host. With 154 well appointed, spacious guest rooms and expansive options for dining, from Pan Asian to delectable Goan cuisines, The Zuri White Sands, Goa Resort & Casino in Varca Beach Goa promises an exemplary experience with a plethora of recreational activities for you and your family so that the fun never stops. Beautiful and exotic a place as Goa is, is best known for its sun-kissed beaches, serene blue seas and lush greenery which has been very well maintained; you find a reflection of the same at The Zuri White Sands, Goa Resort & Casino. This Goa resort also boasts a gigantic meandering swimming pool that stretches across the resort, making for a location that is a grand sight to behold. Having won the prestigious Carlson President’s award for “Best Hotel” consecutively for four years in a row, we continue to offer our guests the best of service and amenities as well as our the latest addition, the newly opened casino–The Dunes, the only one of its kind in the land of Goa.